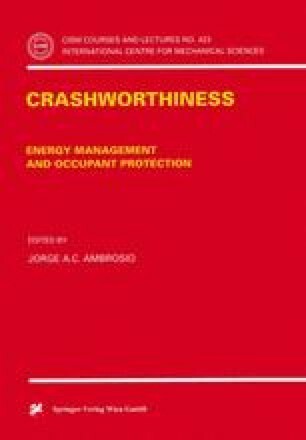 Crashworthiness emerged as an extensively explored engineering field in early 60 following introduction of the safety standards in the US automotive industry. The new regulations posed a serious challenge to both practicing engineers responsible for the development of safe vehicles as well as to scientists and researchers developing predictive tools. Crash response of structures involves a number of highly nonlinear phenomena such as localization of plastic flow, interaction of local and global buckling modes, large deformations and tearing of material. The industry driven requirements for adequate computational tools capable of capturing all the above phenomena triggered the development of a number of dedicated tools and techniques. In the early days of crashworthiness experimentation was the main design tools in the automotive industry. At the same time numerical techniques, especially FE methods were progressing rapidly towards highly reliable simulation tools. However, it has been soon recognized that precise numerical analysis is not always the only ‘thing’ the engineer needs. In many cases less accurate, qualitative answers might suffice or at least help in better understanding of a given crash phenomenon and assist in planning of simulation and experimental program.